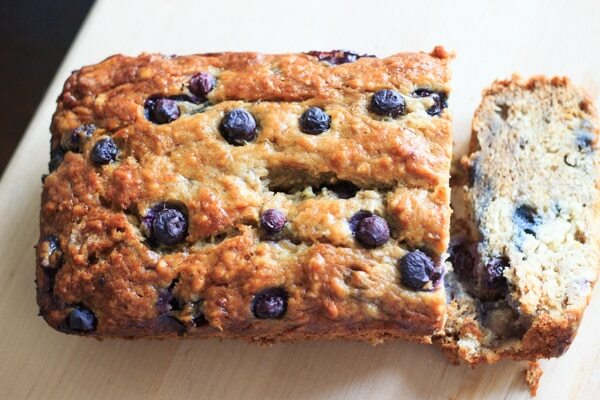 Blueberry banana bread – double the fruit and double the deliciousness! All the sweet slices will be gone before you know it. Have you ever put blueberries in banana bread? I was inspired to try it from this recipe over at Oh My Veggies. Her recipe is vegan, and while I wasn’t yet feeling that adventurous, I did think that adding blueberries was a great idea. I know I said I was not prepared to feed my visiting family members the other weekend, but I did plan enough to at least make this bread ahead of time. Though this would probably be a good side for any meal, it is probably best paired with brunch since it is a sweet bread. Blueberries are in season, so I’m trying to find ways to use them in everything – smoothies, salads, and now even bread. I just can’t get enough blueberries. I LOVED the extra fruit in this bread. My recipe added 1 cup of blueberries, but there’s room for you to add even more than that if you wanted extra flavor. I also added a teaspoon of ground cinnamon, which is optional, but does give it a nice extra flavor. Banana bread always takes longer to bake because of the texture, but it’s worth the wait! I baked at 350F for about 70 minutes. A lot of times I see a glaze added to banana bread, but I don’t think this recipe needs one. It’s sweet enough to eat without glaze, because this is recipe certainly isn’t plain! What else do you like to add to your banana bread? 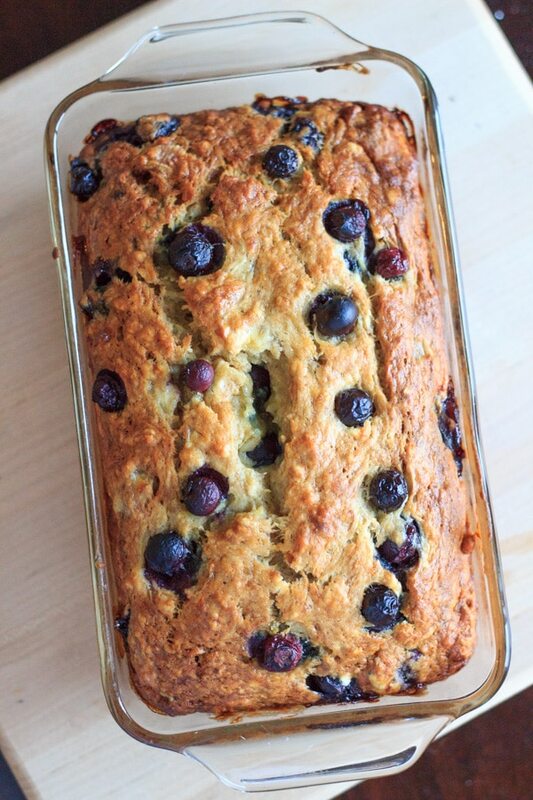 Blueberry banana bread - double the fruit and double the deliciousness! All the sweet slices will be gone before you know it. In a large mixing bowl, mash ripe bananas with a fork. Add in egg and vanilla and mix well. Add in sugar and melted butter, and cinnamon if using. Spray a bread pan with oil and pour in batter. Bake at 350F for 65-75 minutes, or until golden brown. My favorite baking dishes + cinnamon are available in the Trial and Eater amazon store! Banana bread always wins my heart, but blueberry banana bread? I’m practically shooting hearts out at it. Looks uber yummy! Thanks Pamela! Definitely worth a try! This looks fantastic Kelly! 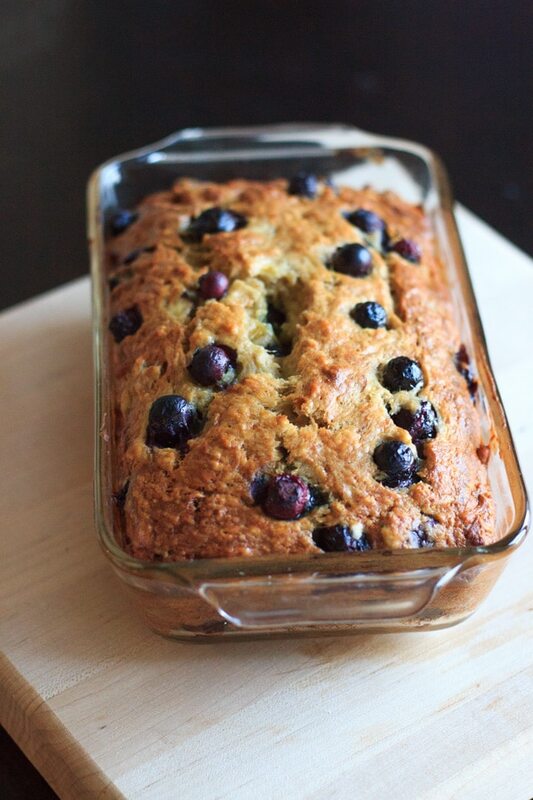 I love banana bread and adding blueberries sounds so so good! Yum! I love the pop of color they add to the bread! 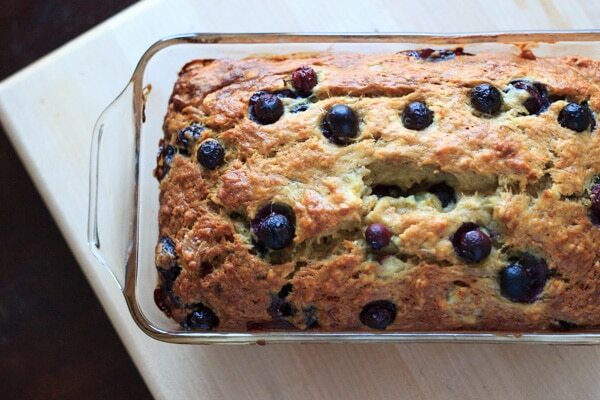 Blueberry banana bread is such a great combination! Definitely jazzes it up a bit! 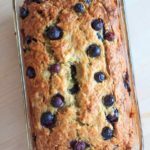 Banana bread is one of my favourite treats, but I love the addition of blueberries to this. Great recipe! I just picked up a bunch of blueberries! This bread looks like a great way to use them! I’ve always wanted to go blueberry picking! I love banana bread but haven’t tried adding blueberries! This looks delicious! Thanks Bianca, I hope you try it! This banana bread looks wonderful!!! OMG!!! I made this yesterday and it turned out amazing!!! My photo did not turn out as pretty as yours of course:-) but it was a huge hit…no surprise!!! Your recipe was perfect! So excited to try more…this maybe dangerous for our waistlines, yikes! Great Job Kelly and thanks for sharing! Thank you so much Lynnda! It’s fruit, so that makes it healthy right? 🙂 I love hearing the feedback, keep it comin’! I just made these as muffins and they took 22 minutes. Delicious and a wonderful texture. Thank you for the recipe! So glad you liked them Kadi, thanks! Frozen blueberries tend to add extra moisture and/or sink to the bottom, but if you rinse and dry them well that should help. Tossing them in a bit of flour helps too! You can substitute bread flour in a pinch, the difference is that bread flour has more gluten. But it will result in a different (chewier) texture! Great recipe! I added 1 cup of white chocolate chips & it was perfect. This bread is not overly sweet, even w/ the added chocolate. This is definitely a keeper.